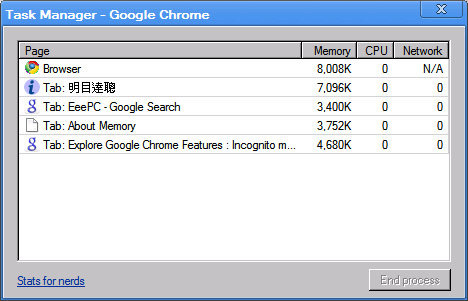 The Google Chrome just released today, so I installed it and have a try. The interface is quite simple, working fast and smoothly. Among the new features, I like the Incognito mode the most. With Incognito mode, it will not leave any trace of websites you have visited. All cookies and browsing history will be deleted when the windows was closed. It would be useful for visit the online banking and shopping website, such that it would lower the chance for malware or other people to get your personal data. 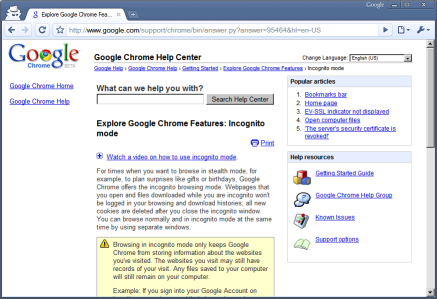 To go to Incognito mode, you have to choose "New incognito window" under the "Page" menu. Notice the incognito icon on the top left corner to indicate this window is operating in incognito. You cannot drag any tab within incognito window into a normal mode window (and vice versa). The second feature I love is, you are freely to move tabs among different windows (of the same mode). And you can make any tab as a new window by drag it out of the current window. 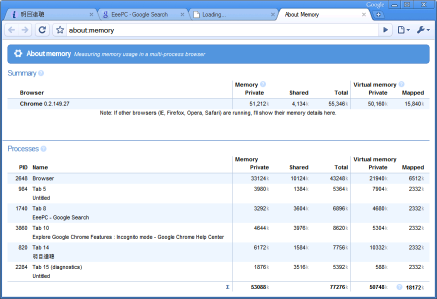 The thrid one is the "Task manager", which list out the memory usage of indivudual website you are browsing. It is useful for web developer and system/network administrator to do optimization.